With the sun hopefully returning to Whistler to stay the local lakes are once again teeming with those who prefer to cool off in the water. 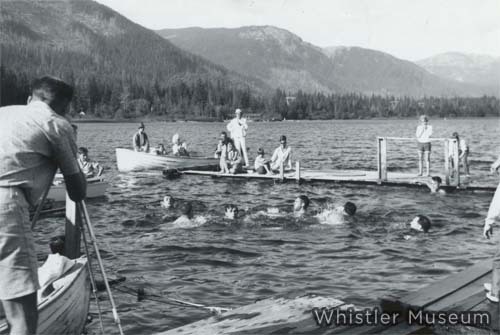 Looking through photos in our archive it’s easy to see that swimming has always been a popular summer pastime in Whistler, one that has changed relatively little in the past hundred years. 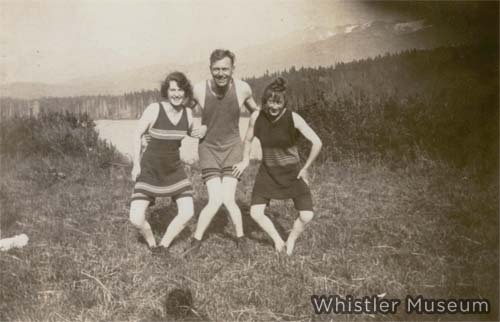 While Alex and Myrtle Philip operated Rainbow Lodge Alta Lake was the most popular summer destination for days spent in the water. Not only did the lake make a hot summer day tolerable but with views such as those seen from the shore it would be hard not to enjoy your surroundings. Like today, guests and residents alike could be found splashing around the docks, though for some the idea of a cool swim doesn’t appear to have been such an appealing one. 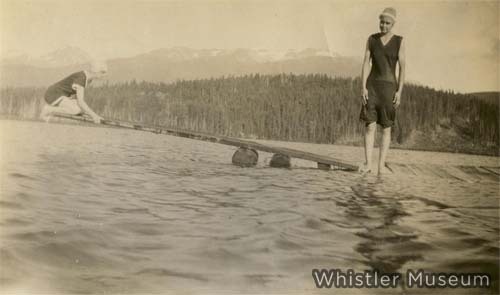 Although diving boards have disappeared from Whistler lakes the water is still cold enough to cause hesitation in some people. The only glaringly noticeable difference between swimming in the early twentieth century and swimming now is the bathing costume, or swimsuit. Though the same strokes are used to move through the water it is rare to find someone on the beach in apparel similar to that modeled by Jean Tapley, Katie McGregor and their friend. Though not covering quite as much as the popular two piece suits of the nineteenth century which included a knee-length gown and trousers to the ankles, these suits are still very modest compared to those found today. Alta Lake, along with Lost Lake, Alpha Lake, and others, is still a popular place to spend a day, whether you live here or are visiting. 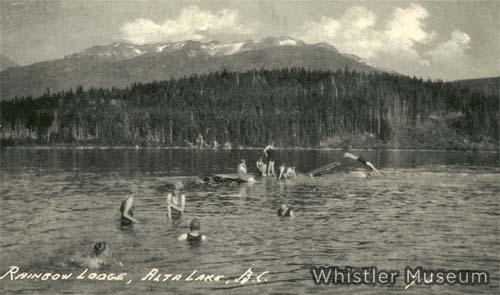 Though Rainbow Lodge is now gone (apart from a few cabins still at Rainbow Park) it is still possible to have the same swimming experience as the first guests to Whistler. 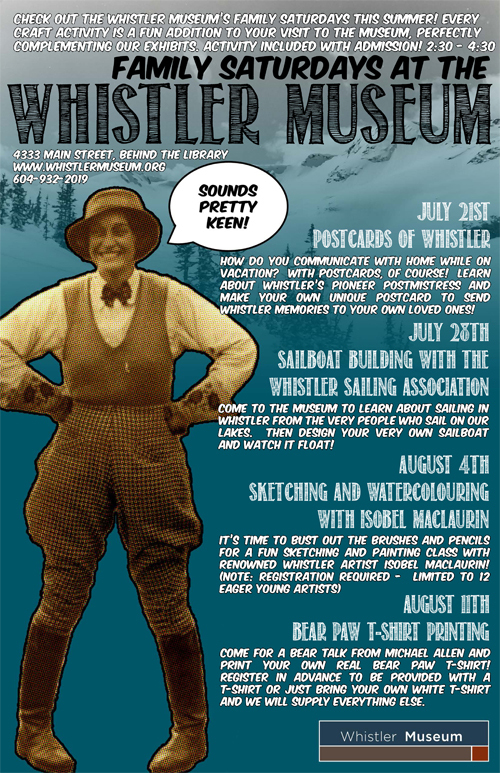 The Whistler Museum and Archives Society looks forward to a summer full of family fun! We would like to welcome the Whistler Sailing Association, Isobel MacLaurin, and Michael Allen to the Whistler Museuma s they guide our activities and share with us their knowledge of all aspects of Whistler’s culture and history. Every craft activity is a great addition to your visit to the Whistler Museum, perfectly complementing our exhibits. Fun and interactive activities will have your child curious and eager to learn more. Activity included with admission.